Our 2018 Summer Forecast kicks off with the highly anticipated rookie class. 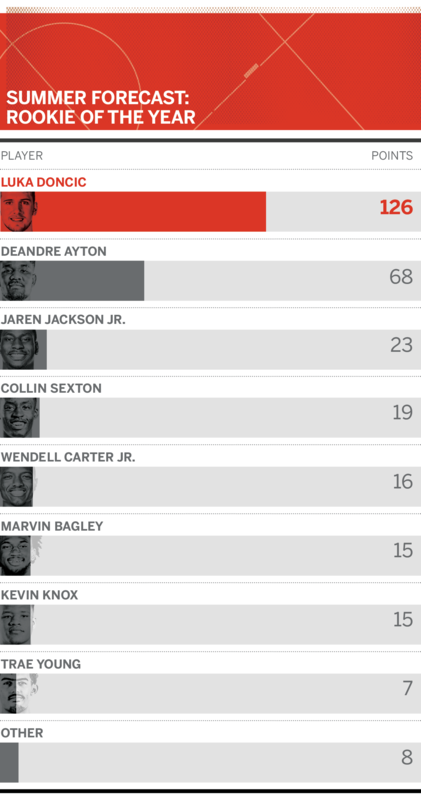 Is Deandre Ayton the savior the Suns brass need him to be? Can Marvin Bagley III double-double his way to Rookie of the Year contention with the Kings? Will the Mavericks' Luka Doncic prove to be the best rook of the bunch given his modern-day fit as a 6-foot-8 playmaker? We asked our ESPN Forecast panelists to rank their top choices for the 2018-19 NBA Rookie of the Year. Our panel's ROY frontrunner is the most NBA-ready prospect in the 2018 class with a roster suited to his strengths. Ayton can register 20 and 10 in the box score by virtue of his Zeus-like frame and tremendous agility. On a Suns team that lacks interior presence, Ayton is poised to play as many minutes as any other rookie in his class. While a unique long-term prospect, Jackson might not get the scoring opportunities to compete for ROY, at least as long as the Grizzlies try to remain competitive. Sexton will benefit from veteran floor spacers Kevin Love and Kyle Korver opening up driving lanes, along with George Hill, who can play on or off the ball. Carter shined at summer league, spacing the floor, scoring on the block, facilitating, rebounding and even switching screens with great success thanks to his improved conditioning. Carter will have to leapfrog Robin Lopez in the starting lineup and get enough looks alongside scorers Lauri Markkanen, Zach LaVine, and Jabari Parker to compete for ROY, but he showed at Duke that he doesn't need much volume to be effective. With our panel's voting likely influenced by Bagley's pedestrian summer league performance, he should still be considered a ROY candidate. Bagley is an instinctual, aggressive scorer who rebounds the ball at a high level and doesn't need a lot of plays called for him to get his points. With his versatile scoring attack, Knox has a legitimate chance to win the award. Knox was used exclusively as a small forward with little spacing at Kentucky, yet he's capable of much more as a small-ball 4 surrounded by shooting on an NBA floor. Also receiving votes: Mikal Bridges, Suns (3 points); Harry Giles, Kings (3 points); Shai Gilgeous-Alexander, Clippers (1 point); Lonnie Walker, Spurs (1 point).